We are thrilled to bring you The Portrait Lounge!! "We" are Zev and Maureen Fisher. After seeing old school photo booths at many weddings and corporate events, we realized we could take this concept and improve on it by offering clients a more elegant and versatile version. We wanted something that would fit in seamlessly in a variety of venues, break out of the 'booth' by offering an option for more than 2 guests at a time, and have it be a hilarious and creative experience for guests...and The Portrait Lounge was born! 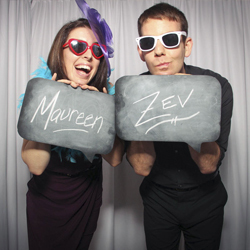 Zev is a professional photographer, shooting both corporate events and weddings, and Maureen has years of experience in Boston's event planning industry. We are very excited to bring The Portrait Lounge to our clients and something new to the Boston area! !